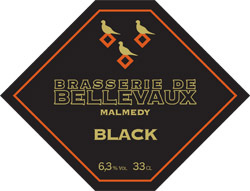 Brasserie de Bellevaux is located on an old farm 150 kilometers southeast of Brussels. Black is the result of co-owner Wil Schuwer’s desire to recreate a beer he tasted on a 1978 pub tour in the British city of York. Aromas of Dutch-processed cocoa and lightly roasted coffee mingle with a slight grassiness as this dark-stained beauty pours into the glass, leaving just the slightest whisper of a light tan head. The body is softly effervescent, just enough to allow all the aromas to play upon the palate. Slight mineral notes sneak in, giving this already compelling offering even more depth and interest. Despite all this perceived complexity, this surprisingly nimble beer has a dry finish, making it a fine dining companion with a cornucopia of fare, from cheese and bread to smoked meats and perhaps even a chocolate treat or ice cream for dessert. The aim, I understand, is to re-create an English old ale, and there are, certainly, recognizable elements of that style in this deep ruby beer—plummy fruit and a tilt toward sweetness. But, to me, this adventurous Belgian beer is more akin to a stout, with roasted grains bringing notes of licorice, chocolate and smoke that linger long in the quickly drying, bitter finish. Stylistic quibbles apart, however, there’s no denying that it’s a fine beer that drinks clean and fresh. Just a shame the label doesn’t say more about what’s in the bottle.